The YYNMOS-1 module includes an 80n03 power N channel MOSFET transistor and a L217 general purpose optocoupler, integrated in the same board. You can use this module to isolate and control high current loads directly from your microncontroller. Dimensions (in mm): 37.5 X 23 X 16. 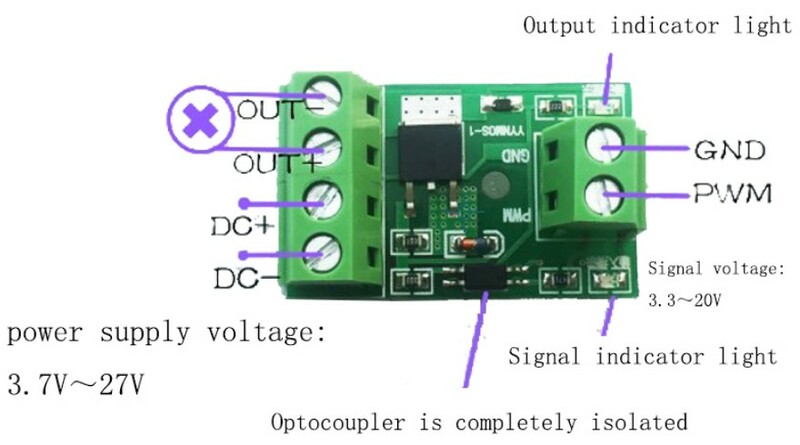 The output port can control high power devices like: motors, lamps, LEDs, DC motors, pumps, valves, etc. OUT-: output port negative (connect it to load negative). Click the button below to add the Optocoupler MOSFET Driver Module to your wish list.